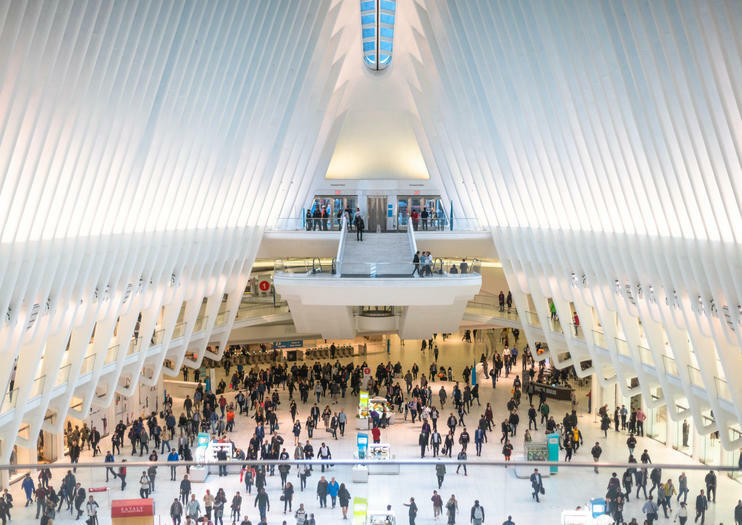 New York City is known for its many world-class museums, so it can be hard to decide what to squeeze into your sightseeing schedule when you’re in the city. Here are our picks for the top five cultural, memorial, and science institutions in NYC. Pay your respects to the victims of the tragic September 11 attacks at the National 9/11 Memorial & Museum, located at the site of the World Trade Center. Read the names of the attack victims inscribed at the open-air memorial's reflecting pools, and see photographs, artifacts, and informational exhibits about the effects and significance of 9/11 at the museum. How to Visit: The memorial is free to enter, but the museum has an entry fee. Go on your own by booking admission in advance, or take a 9/11 Memorial tour with a guide who can share insight about that harrowing day. Located on the aircraft carrier USS Intrepid, the Intrepid Sea, Air & Space Museum is dedicated to American maritime and military history. In addition to the Intrepid, a submarine, space shuttle, and supersonic plane are also on display. How to Visit: The museum is on the Hudson River at Pier 86. Book admission in advance to avoid waiting in the ticket line. Paintings by the world's most famous artists hang at the Metropolitan Museum of Art, as well as sculptures, Egyptian antiquities, Islamic art, medieval armor, fashion, and much more. It's the largest art museum in the United States, home to works by El Greco, Caravaggio, Vermeer, Degas, Monet, Picasso, and Kandinsky. How to Visit: The Met sits on 5th Avenue on the eastern side of Central Park. You can go on your own, of course, but with its size, it's helpful to book a tour, allowing you to relax while a guide makes sure you don't miss the highlights. For special access, opt for a VIP tour. A planetarium, a library, and nearly 50 exhibition halls make up the American Museum of Natural History, known for its displays of fossils, animals, plants, human remains, and cultural artifacts. Its dinosaur exhibits are among the favorites. How to Visit: The museum sits across from Central Park on the Upper West Side. Purchase a ticket in advance to go on your own, or book a tour with a guide to receive insider information about the museum's many treasures. Considered one of the world's most influential organizations for contemporary art, New York's Museum of Modern Art, aka the MoMA, features paintings, drawings, sculptures, electronic works, architecture, and photography. Must-sees include pieces by Pollock, Picasso, and Warhol. How to Visit: Book a skip-the-line ticket to this Midtown Manhattan and avoid the crowded queue, or opt for a city sightseeing pass that includes admission to several select attractions. For a VIP experience, an early morning tour allows you to visit before the public arrives. Gain admission to The Intrepid Sea, Air & Space Museum, New York City's only educational institution housed on an aircraft carrier. Make your way to the Hudson River to see the flight deck and more on the legendary USS ‘Intrepid.’ In addition, you’ll get up close to the first space shuttle (the ‘Enterprise’) and explore a guided missile submarine (the USS ‘Growler’). You’re connected to history and innovation through interactive exhibits and firsthand accounts — something the entire family can enjoy. It’s possible to spend an entire day inside the Metropolitan Museum of Art and still not see everything. Which is why this 2- or 3-hour tour is the best way to take advantage of the riches that are inside one of the world’s greatest art museums. With a knowledgeable guide at your side the entire time, you’ll see the highlights of the collection and get special insight into the works of art on display. Best of all, this tour allows you to skip the line and just waltz right into the Met. From May to October, you can also lounge on the rooftop garden and get great views over Central Park. This small-group tour is limited to just 15 people. The Met presents over 5,000 years of art from every corner of the world for everyone to experience and enjoy. The Museum lives in three iconic sites in New York City – The Met Fifth Avenue, The Met Breuer and The Met Cloisters. With your 3-day admission pass, explore the world-famous Metropolitan Museum of Art in New York City in all three locations. The Met boasts hundreds of events and programs each month — including lectures, performances, tours, family activities and more. Avoid the hassle of waiting to enter New York City’s Museum of Modern Art with this convenient skip-the-line ticket that grants you entrance on arrival. It’s not surprise that MoMA is an incredibly popular attraction. With artists like Andy Warhol, Vincent van Gogh, Jackson Pollock, Cindy Sherman and many more, the queue can be backlogged for hours. But with your handy skip-the-line ticket, you’ll glide right past it and head straight to the good stuff. Plus, your ticket includes admission to MoMA PS1, the contemporary art center in Long Island City. Get a renegade take on New York City’s Metropolitan Museum of Art with an exciting 2-hour art tour through the Met’s weirdest, most wonderful and scandalous displays. Enjoy exclusive skip-the-line access, then follow your guide through the museum’s sprawling galleries to hear insider secrets about infamous artists and their creations. Make your museum visit a fun adventure with games, selfies and surprises as you experience the Met on your own terms.This is an unconventional tour of the Met. Not recommended for participants under 16 years old. Explore the American Museum of Natural History with a passionate, maverick guide on a 2-hour renegade tour through one of New York City’s most exciting collections. Hear the secrets, scandals and amazing science behind the displays, then learn insider stories about the animals and adventurers you’ll encounter. Capture unforgettable images of the museum’s weirdest and most wonderful objects, and experience NYC’s world-class cultural treasures—on your own terms.This is an unconventional tour of American Museum of Natural History. All participants must be 18 years or older.